The biggest fights in the European Union are always about money, so there was never any reason to suppose that the Brexit negotiations would be any different. Last year, Treasury figures show the UK paid about £13bn to the EU, around £200 per person. Some of which then gets spent in the UK. But the European Commission is trying to calculate what the UK's outstanding financial obligation should be when it leaves. The EU argues that the UK has made a series of big financial commitments as part of the current seven-year budget that need to be paid on exit. It also says the UK needs to settle its share of what's known as the "reste à liquider". This is money that has been committed but not yet paid - in effect the EU's credit card bill. What is at stake in EU-UK talks? Here's the problem for the EU: the less the UK agrees to pay, the more other countries will have to fill the gap. That means that countries that are net contributors to the EU budget, like Germany or the Netherlands, will have to pay more. At the other end of the scale, the countries that are net beneficiaries, like Poland or Greece, will receive less. So when the UK argues that the EU is being unreasonable in its demands, it has no allies at all. The hard line approach adopted by the European Commission has come from pressure from other member states. They don't think, for example, that the UK should be entitled to a share of the EU's assets when financial calculations are made. British officials spent several hours during this week's negotiations questioning the legal basis of the EU's proposals. But they haven't put forward counter-proposals of their own - which, in turn, is annoying European officials. How can we negotiate, they argue, when we don't know what you want? Hence the pessimistic tone of Europe's chief Brexit negotiator Michel Barnier, who again insisted that the divorce deal must be agreed before talks move on to discuss issues such as the future trade relationship. 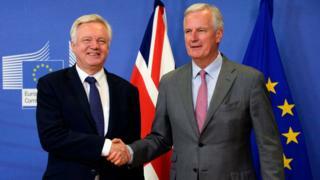 Mr Barnier claimed there had been "no decisive progress" and the negotiations were still "quite far" away from being able to move on to other issues. The EU hasn't publicly put a figure on the amount it thinks the UK should pay, but many estimates come up with a net figure of about 60 billion euros. The UK says it won't pay anything like that. One possible route out of the impasse is talk of a transition period. If the UK was still paying into the EU budget for two or three years after Brexit, that could help reduce the final exit bill considerably. It would also fill a hole in the EU budget, and generate goodwill elsewhere on the continent. "In October when heads of state get together there will be an opportunity for Theresa May to make the case that she can only write a cheque if it's packaged as part of a bigger deal that gives the UK concessions on both transition and future trade terms." It is worth remembering that compared to what's at stake in renegotiating the UK's entire trading relationship with the EU and the rest of the world, even 60 billion euros or more isn't a huge amount. But politically, it's explosive. And three months after these negotiations finally began, under pressure of time, it has become the toughest nut to crack. In the end it will have to be resolved by political decisions rather than legal or technical advice.